Note: If display detects machine, some values are automatically populated. Connection offset measures inline distance from center of rear axle to connection point. Connection point is location where implement connects to machine. Connection type, or hitch, describes how implement is attached to machine and controls how display determines implement movement behind machine. Connection offsets only need to be entered for connection types that are used. 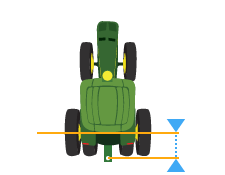 Note: Connection offset measurement for articulated tractors is different from GS3 2630 Display measurement. Note: Rear 2-Point connection type offset from GS3 2630 Display is replaced by Rear 3-Point offset and a pivot offset in Implement Profiles.